The Sierra Madre Tattler! 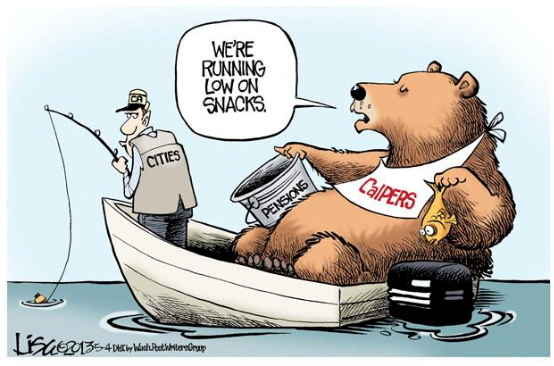 : Transparent California's Robert Fellner On Sierra Madre's $5 Million Dollar CalPERS "Lump Sum Prepayment"
Once again CalPERS has become a perpetual albatross hanging around the necks of all California cities who bought in on this malfunctioning pension system. A cheaper method of managing this money and system needs to be found in 2018. 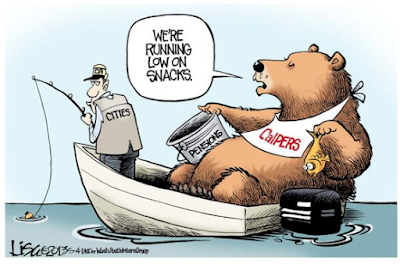 Everything about CalPERS seems fishy. How many CalPERS executives have been arrested/convicted? I don't think any of it is coincidental. It all just seems like a House of Cards. "A former chief officer of Calpers, the nation’s largest public pension fund, was sentenced by a federal judge in San Francisco on Tuesday to 4-1/2 years in prison on a bribery conviction." That one regards Federico Buenrostro. Here is one regarding Alfred J.R. Villalobos, another former CalPERS executive, who committed suicide before his federal charges for (you guessed it) bribery and fraud. Not incidentally, and for obvious reasons, both were big cheerleaders for local law enforcement. Thanks Mod, and thanks Gabe. No thanks in the real world where the rest of us scratch out a living. The council in good faith, needs to stop spending money on items like flashing walk/dont walk signs; apply any money to getting the city out of debt. Can the police officers carry us across the dangerous streets? For how much cops are overpaid, they should do more than just carry us across the streets. They should be our damn butlers and gardeners. How did we ever get into this condition? Has that ever been explained? If any of the readers have parents or had grandparents that lived through the depression, they may remember hearing: "when times are tough, live well below your means." Sierra Madre should think of itself as always facing tough times. If you drive down Santa Anita past Arcadia's median redo you can see there is a city with money to burn. Not here. Provide the basics, clean reasonably priced water, streets that won't tear up your car, fire and police protection within the budget constraints of the city, a modest library earthquake repair/ADA upgrade, etc. Skip the flashing crosswalk signs and don't even consider the Lime Bikes (some cities are already abandoning that ill-faited idea). Arcadia is living way above there means. Look at there debt. City councils are all the same. but look at the beautiful new median dividers on Santa Anita and Huntington Drive. Just a question....has anyone seen a BROWN lawn in front of the Mc Mansions in Arcadia? Hahaha, yes, no lime bikes. We have spotted some bike stands around downtown, none of them match. Pasadena has fired their Metro bikes. It was costing the city a lot and they weren't being ridden as much as everyone said they would. Reduce the library hours and personnel, realistic goals until fund-raising for necessary repairs has been accomplished. Appears as if this article regarding this city council's willingness to spend our money is as well attended as the council meetings. Transparent California has clarified the reasons why the City Manager Gabe Engeland had to restructure CalPERS payments. Good job Mod and Mr. Engeland. When will Transparent California come out in favor of Transparent Tax Receipts—who pays and how much? TC only want to show expenditures for wages, benefits, and pensions. We need to know who pays taxes and how much. And how about naming every company and their owners that have government contracts, amounts paid to them, who granted contracts, etc. Sunlight should shine across the entire spectrum. It's none of your business how much private people and private business pay in taxes. 2:10 threatened by TC much? Weird question 3:48, but since you asked, not threatened at all. Why is ok to know what government employees make? Isn't income private. You want to keep tax payments private because you're not paying your fair share, right? Bet you have a cash business. Or maybe you're padding your deductions. 9:52 I'm not being paid by the taxpayers so my income isn't public. Nor should it be. I quit my govie job and went out to make an honest but less profitable living many years ago. It is hard to appreciate how much time it takes for a private resident to keep on top of all the city activities. That is why it is good for a group to join together and share the effort. This has happened in the past and many projects were watched closely by groups that helped form good policy for various protections: hillsides development zone, canyon zone, downtown zone, general plan, residental development standards, One Carter, Monastery (on going). If you look at who was involved in the projects listed above, you will discover it has been the same people. It's now time for all those who chant "WE LOVE SIERRA MADRE" to get involved and stop making excuses. Reset your priorities or there will be nothing left to love. It's an endless fight - and I don't think the General Plan is worth the paper it's written on. The current council will not fight to protect the monastery. All that has to happen is for the good brothers to hire Richard MacDonald, the developers' boy, and he'll huff and puff and the city will fold. You usually don't get involved until your 'ox is gored.' Yes, it is time for some new folks to chop wood and carry water. After wading through the Pension Rate Stabilization Plan Staff Report, I appreciate Fellner's clarification (confirming) the main items in the report. Thanks Mod and Fellner for bring this to us. Mayor Garcetti says he is looking for more cities like West LA, he has more give away scooters and helmets inorder to have less cars on the road! Not only did the Council approve the 4 flashing (which I thought prudent) they approveed 9 flashing signs. Over the top. I can see it now, kids going up and down the boulevard hitting the walk lights at every crosswalk. When CalPERS goes under, let's not forget all the cop unions that always fought to intimidate our politicians to increase local law enforcement's salaries and benefits. BlueISIS has a lot more power over us than we realize. The only ones that cops "protect and serve" are themselves.